Punjab is one of the most prominent states in Northern India. Punjab is rightly referred to as “Golden state of India” owing to its high performance in all arenas specially agriculture and more importantly the green revolution. The Pre-Independence era has been a turbulent phase in the history of Punjab. Punjab was ruled by many dynasties like the Mongols, Persians and Mughals. The state is home to one of the earliest civilizations of the world: the Harappa civilization. Unrest was experienced widely during the Pre-Independence era. During the 15th century, Guru Nanak laid the foundation of Sikhism, with oneness as the basis of the religion. The British rule led to many revolutionary upsurges. Bhagat Singh, Lala Lajpat Rai, Udham Singh were great freedom fighters who laid down their lives during the freedom struggle. After India’s partition in 1947, Punjab rose towards development in all sectors. 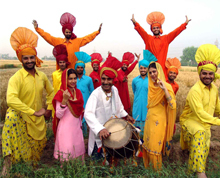 Natives of Punjab are referred to as “Punjabis” and “Punjabi” is the widely spoken language of the state. “Chandigarh“ the capital city has the credit of being a planned city. Punjab has the reputation of being the “Granary of India” due to its high agricultural growth. Punjab derives its name from the fact that it is home to five major rivers like Ravi, Chenab, Sutlej, Beas and Jhelum. Punjab attributes its rich agricultural produce to these rivers as Punjab is rich in alluvial soil. Though Punjab accounts for only 1.5% of India’s geographical area, the state boasts of the highest agricultural produce. Major crops include wheat, cotton, rice, jowar, corn. The “Bread Basket of India” leaves no stone unturned to raise its agricultural produce. Agriculture still tends to be the major contributor to its economy. Industrialization and High Infrastructure development have paved the way for its economic success. Transport system in the state is so well organised that it overshadows the non-availability of a port. Punjab is the abode of “Sikhism” which is practiced by a major portion of the population. The “Golden Temple” at Amritsar stands as a perfect testimony to this fact. Other religious faiths like Hinduism, Islam are practiced in harmony. Punjabis are warm and friendly people and hospitality is an inbuilt trait to them. Punjab has a rich legacy of cultural heritage. Reference to the state is incomplete without its music and dance. “Bhangra” is the traditional dance blending with the tunes of the Dholak (musical instrument). Every event or occasion is accompanied with vibrant music and dance. The attire of the people is very colourful with men wearing kurta-pyjama with turbans and women with Patiala suit and kurti. However the NRI population of the state has brought a tremendous makeover. The modern generation is in tune with the latest trends in the fashion industry. The cuisine of the state deserves a noteworthy mention. Punjabi cuisine has worldwide recognition with its wide range of delicacies. Wheat is the staple food. Non-vegetarian and vegetarian dishes are flavoured with the right blend of spices. Some of the famous dishes include Makki ki Roti, Lassi, Dahi Bhalla, Stuffed Paranthas, Sarson di Saag, Amritsari Macchi and Tandoori Chicken. Punjab takes the credit of feeding most of India. It has year after year has delivered the most bountiful harvests that are way above the national level. Punjab has a robust farm sector, a vast agro market network and efficient procurement system. Punjab produces close to17 percent of country’s wheat and 12 per cent of the rice. 90 per cent of Punjab’s farmland is irrigated. It reaps 17 quintals of wheat per hector. Similarly, it reaps 14 quintals of paddy per hector. Punjab’s Gross Value Added (GVA) in Agriculture is 4 per cent of the total GVA of the country.